Noni, an odd-looking fruit with a pungent, cheese-like smell, has garnered substantial attention since the 90s due to big claims about its medicinal applications. Discover all about noni and the science behind its alleged health benefits. The noni plant is originally from Southeast Asia and Micronesia, where it has been used by the Polynesians for over 2000 years as part of their culinary lore and folk medicine. Noni became widely popular in the 90s as a cure-all fruit; however, its healing properties still under investigation, and further research is necessary to corroborate the medicinal claims that made noni famous around the world. Stimulating immunity. 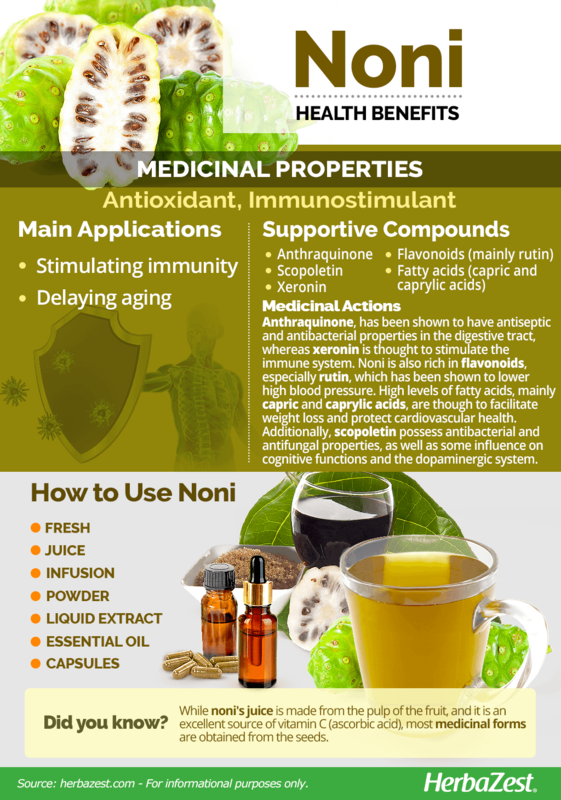 The active substances in noni are thought to ward off diseases by boosting the immune system. Delaying aging. Noni is high in antioxidants, which are thought to contribute to cell regeneration, improving cognitive performance and skin health. Noni of is also commercialized as a weight loss aid, and it has been reported to have a broad range of therapeutic effects against headache, fever, arthritis, gingivitis, respiratory disorders, infections, tuberculosis, diabetes, and much more; however, none of these claims are scientifically supported. 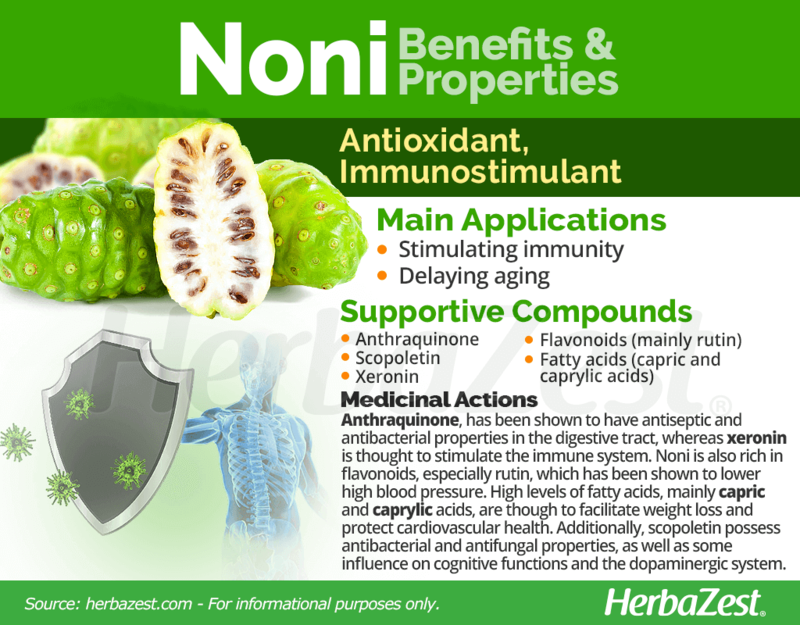 The main compound behind noni benefits seems to be xeronin - an alkaloid that can stimulate the immune system. Likewise, a large number of flavonoids, fatty acids, and other phytonutrients have also been found in the fruit, and its diverse applications are still under research. 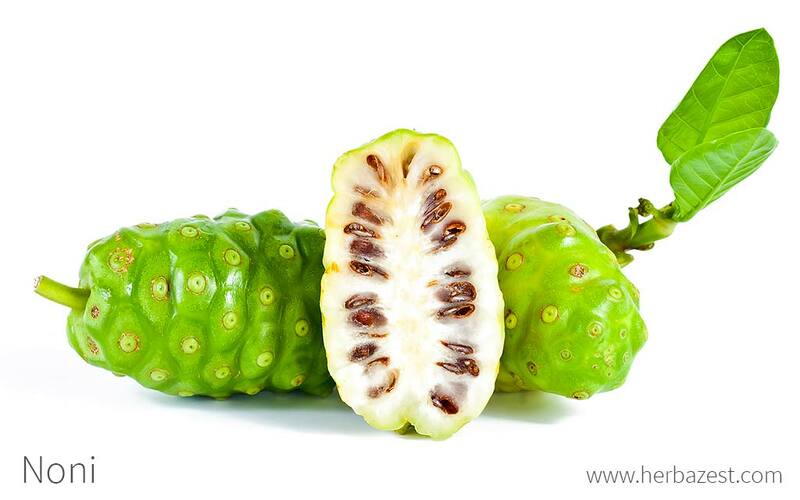 While the noni fruit is the most sought-after part of the Morinda citrifolia plant, noni leaves are also rich in flavonoids; one of them, called rutin, has been shown to lower high blood pressure by increasing the activity of glutathione peroxidase (an antioxidant enzyme) and nitric oxide in the endothelial cells, which leads to a reduced vascular tension and improves blood flow. Noni also contains high levels of fatty acids, mainly capric acid, which gives the ripe fruit its characteristic cheese-like smell, and caprylic acid, known for aiding the breakdown and absorption of triglycerides, which are basically fats stored in the body to be used as energy sources. High levels of triglycerides conduce to weight gain and metabolic disorders, along with an increased risk of cardiovascular diseases. The combined action of capric and caprylic acids in noni is though to facilitate weight loss and protect heart health. Recent in vitro studies have shown that anthraquinone, a phenolic compound contained in noni, acts as an antiseptic and antibacterial agent in the digestive tract, inhibiting common strains like Staphylococcus, Shigella, and Salmonella. Additionally, scopoletin is a coumarin compound that has shown inhibitory effects on bacteria and fungi, as well as some influence on cognitive functions and the dopaminergic system, which opens the possibility of future applications in the treatment of Alzheimer's disease, depression, and sleep disorders. Despite the promising results of preliminary studies, the scientific evidence supporting the nutritional and medicinal value of noni in humans still insufficient, and further research is necessary to corroborate these findings. A high amount of flavonoids is thought to be responsible for the antioxidant, anti-age benefits attributed to noni. Other herbs with immune stimulant properties are cabbage and echinacea, whereas ginkgo and ginseng have been shown to enhance cognitive performance. More research into this herb is needed, and several food and drink manufacturers have been warned by the FDA about making unsubstantiated health claims in regard to noni. What is known is that side effects are generally minimal if even existent. The consumption of noni (either the fruit or its byproducts) is not recommended for those who have kidney problems, since it contains potassium. Some studies suggest a link between liver diseases and noni, so for anyone with liver problems it would be advisable to limit or completely avoid the consumption of noni in any form. 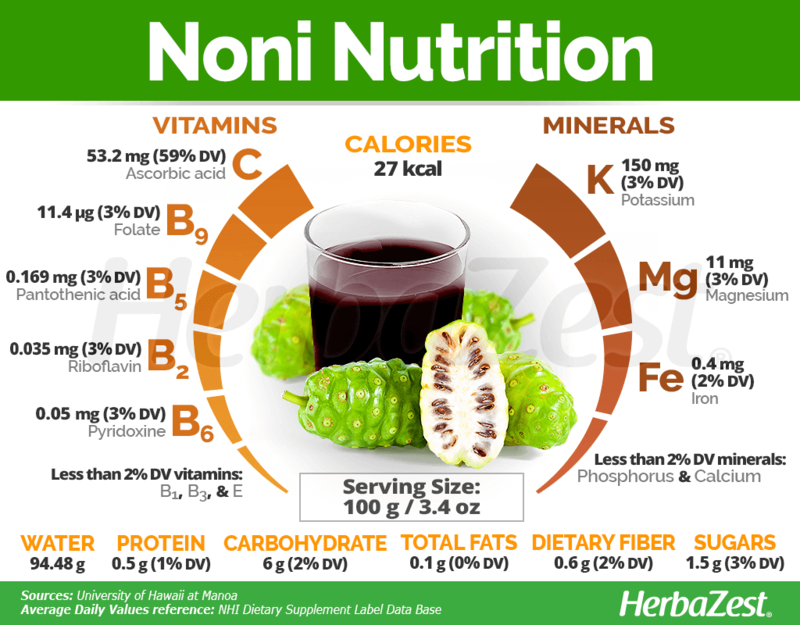 Although low in calories and carbohydrates, the nutritional profile of noni is not as remarkable as its alleged medicinal benefits; however, it provides notably high levels of vitamin C (ascorbic acid), which is far more abundant than any other nutrient in the noni fruit. This water soluble nutrient is not only a powerful antioxidant that promotes immunity, but also plays a key role in the absorption of iron and calcium, both essential for red blood production and strong bones. Noni also provides small amounts of important minerals, mainly iron, magnesium, and potassium, along with vitamins of the B group, particularly B2 (rivoflavin), B5 (pantothenic acid), B6 (pyroxidine), and B9 (folate). 100 grams (3.4 oz) of pure, organic noni juice provide only 27 calories, as well as 2% of the recommended daily value for carbohydrates and dietary fiber, respectively. There are three main ways to consume noni: fresh, cooked as part of a larger preparation, or in supplement form. In some Asian countries, the young leaves of the noni tree are cooked asvegetables and eaten with rice. In Java and Thailand the mature leaves are wrapped around fish for cooking, and the buds are also consumed as food. In Western countries, the consumption of fresh noni fruits is usually limited to people who are looking for a specific short-term health benefit, as its strongly pungent and acidic flavor is not favored by most. WHILE NONI'S JUICE IS MADE FROM THE PULP OF THE FRUIT, MOST MEDICINAL FORMS ARE OBTAINED FROM THE SEEDS. Fresh. The taste and pungent smell of the noni fruit can be unpleasant, so it tends to be mixed with other fruits or sugar to be more palatable. Juice. Since fresh noni fruits are not easy to come by outside of their native areas, noni juice is arguably the most popular form of reaping its antioxidant and immunostimulant benefits. Infusion. The dried leaves of noni are rich in flavonoids, and can be steeped in water to make a warm infusion. Noni tea is commonly taken to strength the immune system. Powder. This form of noni is easy to store and has a long shelf life, providing not only dietary fiber, but also all the nutritional and medicinal benefits of the fruit. It can be added to shakes, smoothies, and juices. Liquid extract. Obtained from a distillation process, this preparation is meant to be diluted in water or juices, and concentrate the immune stimulant, antioxidant properties of the fruit. Essential oil. Obtained by cold-pressing the seeds of the noni fruit, this preparation is intended for topical use and has antibacterial, wound healing effects. Its antioxidant power can help improve skin health. Capsules. This supplemental form of noni is consumed as a whole-body tonic. It allows for a fast intake, easy dosage adjustments, and a consistent concentration of the active ingredients. Although fresh noni fruits are increasing their presence in markets and organic stores around the world, organic noni juice (without added sugars) is the most popular form of the fruit, and it can be found in most large grocery stores and supermarkets. Aside from the fruit juice, the most common presentation of noni is in powder form, which is widely available through online retailers. Medicinal preparations of noni are mainly found in specialized health stores. In addition, there is a wide variety of noni supplement choices available through online retailers. Each brand of supplement may come with different concentrations or dosages, so it is important to read the labels and follow the directions for best results. People with specific health conditions or taking prescribed drugs must seek medical advice before start consuming herbal supplements in therapeutic doses. Although the noni plant (Morinda citrifolia) naturally belongs to tropical regions, this hardy perennial can be grown in a wide range of climates. However, in order to thrive, the noni tree requires some basic care and soil conditions. The noni tree can be grown from seeds, but it is usually more profitable to propagate it from stems or cuttings, since seed germination can take up to 12 months. To get the best yields from noni, the plants should be spaced 10 feet (3 m) apart in order to avoid overcrowding and pest susceptibility. Moderate irrigation is necessary in order get the best possible fruit quality, although the noni plant can resist droughts if need be. Frequent pruning is strongly encouraged, since the noni tree can easily grow to 20 feet (6 m) tall, which would make it impossible to manage and harvest. Stem propagation makes the plant more susceptible to plagues and diseases, particularly nematodes. Noni is a small evergreen tree or shrub, native to Southeast Asia (Indonesia) and Australia, but widely adapted to other tropical regions of the world. A mature noni tree typically reaches up to 10-20 feet (3-6 m), and its inconspicuous, white, star shaped flowers grow around a globular head and have five stamens. Noni's elongated, glossy leaves somehow resemble those of citrus species. The noni tree sometimes supports itself on other plants as a woody climber. Depending on the variety, there is much variation in overall plant form, fruit size, leaf size and morphology, palatability, odor of ripe fruit, and number of seeds per fruit. The noni tree (Morinda citrifolia) is a member of the Rubiaceae family, which contains approximately 13,000 species of flowering plants, notably including coffee (Coffea arabica). Other medicinal plants within the family are cat's claw (Uncaria tomentosa) and cleavers (Galium aparine). The botanical name for the genus, Morinda, comes from the combination of two Latin words: morus, 'mulberry', and indicus, 'Indian', in reference to the similarity of the noni fruit to that of true mulberry (Morus alba). The species name, citriflolia, indicates the resemblance of the plant foliage to that of some citrus species. There are two main varieties of noni: Moringa citrifolia var. citrifolia, with elongated leaves and cultivated mainly in Hawaii, and Moringa citrifolia var. bracteata, which grows mostly in Indonesia and can be recognized by the white bracts that surround the fruits. In addition, Hawaii also possesses a specific cultivar of noni known as 'Potteri', with variegated, white and green leaves. For over 2,000 years, noni has been an important food source across different Pacific islands. The early French Polynesians consumed it in times of famine, while people in Burma (modern day Myanmar) cooked the unripe fruit in curries and ate the ripe fruits with salt. Australian aborigines were also fond of this fruit, and they were the first to apply its medicinal properties. On the Asian continent, the seeds, leaves, bark, and roots of the fruit were also eaten in India, Burma, and the Philippines. Nowadays, the production of noni and its related products are a multimillion-dollar industry. 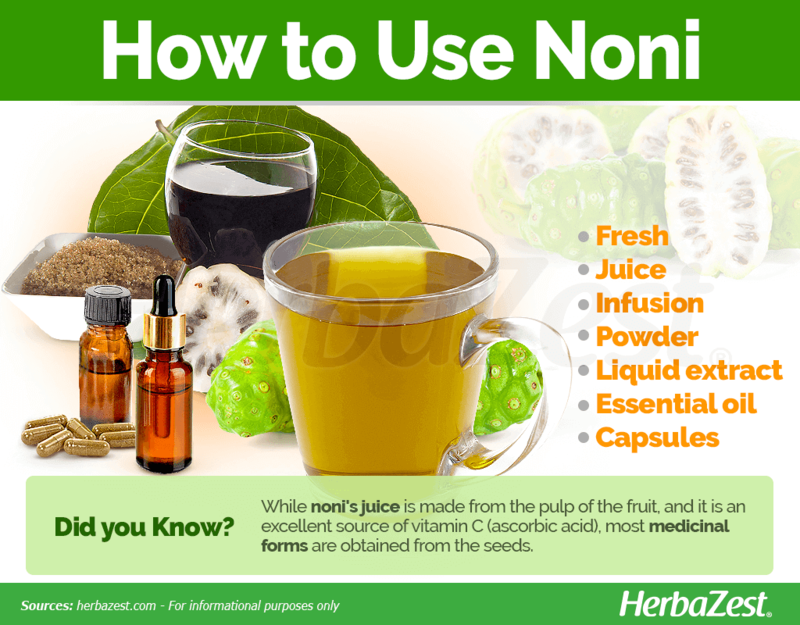 The biggest commercial value of noni is in beverages, fruit powders, toiletries, and oil. The biggest markets for noni currently consist of Asia, Australia, and North America, and the largest producer is Hawaii. The worldwide market for noni moves an estimated $400 million USD annually. In its native regions, both noni plant and fruit have been used as a "ghost medicine," based on the religious belief that ghosts are repelled by their pungent smell. Cosmetics. Due to its antioxidant properties, which benefits skin appearance, the essential oil and extracts of noni are also used in personal care products. Gardening. Noni is an attractive shrub which is generally well suited for home-gardens and landscapes. Timber. The wood is used for the construction of canoe parts and paddles, axe and adze handles, as well as digging sticks, and the roots are used for carving. Fuel. The trunk of the noni tree is used for firewood. Dye. The bark contains a red pigment, whereas a yellow pigment is obtained from the roots. Dyes from noni have been traditionally used to color clothing and fabrics. Fodder. The leaves of noni are also used to feed livestock and silkworms. Repellent. The foul-smelling oil obtained from the noni seeds is used as scalp insecticide or insect repellent.